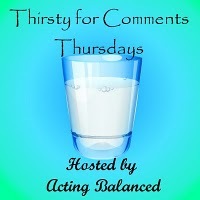 Thirsty for Comments Thursday blog hop! I've spent several posts ranting about blog hoppers who 'hit and run' to collect followers and numbers - That's not why I join blog hop memes, and I know from comments left on those rants, that others feel the same way... so I've decided to do something proactive and create Thirsty for Comments Thursdays! This is a laid back meme designed to get meaningful and heartfelt feedback from people who will actually take the time to read your post! as well as visiting as many of the other link ups as you want! 3. Visit AT LEAST two other blogs and READ the posts and comment thoughtfully on the post. 4. Follow the blog if you like, but it's not required... this hop is all about giving good comment! but you don't have to do that either. Please leave feedback about what you think of this Meme idea. Any and all constructive feedback is welcome! One person who links up will be featured as the co-host next week!